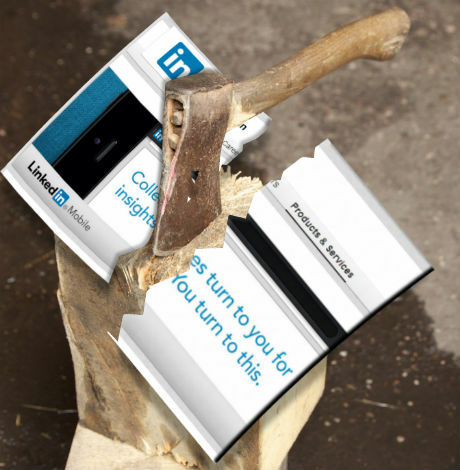 LinkedIn has announced that it is removing the Products & Services tab from Company Pages so that they can “focus on areas of the product that have proven more valuable for administrators and more engaging for your followers“. This comes just a few weeks after Facebook announced that it was killing off its email service “because most people haven’t been using their Facebook email address“. In the middle of last year Google retired its Reader service because “usage has declined” which was part of a cull (“spring clean” they called it) of a whopping 70+ failed features and services over a period of 18-months. When it comes to decisions about the future of low impact services, there can be many voices around the table. The one voice that doesn’t have its own agenda, is the data. When a product clearly under-performs – doesn’t deliver a return on investment, sees comparatively little or no growth or doesn’t poll highly on customer research – the other voices become less relevant. The numbers simply didn’t stack up for Facebook management with not enough people using their @facebook.com email address. There were probably some red faces around the management table, however regardless of the blame, the feature was probably never going wash its own face and so its time was up. The attention span of the average web user is getting shorter and shorter. Every pixel of space on your web real estate is therefore getting more and more precious. Each Product Team will fight for their share of customer attention, however if the product ain’t delivering then it doesn’t deserve to distract customers from the things that do deliver revenues. Google is the master at allowing teams to bring new concepts to market. As a result it needs to actively manage the clutter for customers. They do this effectively through their shortcuts menu item on the top right of Google-owned pages, where no more than the eight most popular services are presented at any one time. But they also actively cull non-performing features. Facebook wants to be your everything, but sometimes it just can’t deliver. When the Facebook email service was initially launched it was heralded as the “Gmail killer”. It turns out that Facebook is actually not that good at email. Another way to explain what happened here is that Facebook realised that it would never be as good as Google at doing mail. It is good that they figured that out sooner rather than later. Companies that don’t know what they are about will end up doing random stuff in the hope that it provides a new opportunity. The best thing that most companies can do is to identify what they are good at and do more of that and less of the stuff they know sweet f*ck all about. When you are managing a product offering that is not delivering results, it has the frustrating effect of draining more resources than it deserves. Often, the fixed costs for operating a failing service can be similar to the fixed costs for administering a performing service. These costs range from technical infrastructure to the product or customer teams required to provide even minimal support. Furthermore management will find themselves, unwittingly, investing more effort trying to figure out how to turn around the performance of an ailing product than into further improving the performance of successful products. Problems soak up attention. It is sometimes best to simply cut and stop the leakage into stuff that will not work out in the long run. Strategic focus is that intersection of a company’s mission and passion, its value proposition to customers, and its recognised core competency. Successful companies need to find mechanisms to prevent themselves from getting distracted by every other opportunity that comes along. The sharper the focus on the activities that are core to delivering a company’s mission, that it can sell to customers and that it is actually good at, the better chance that company has of succeeding. Businesses that are able to focus on the small number of things they are good at, often have more consistent superior economic performance. Even large scale diversified corporations such as Google or Facebook, have clear strategic focus areas and find themselves regularly needing to drag themselves back on track. Companies that don’t push their boundaries will not succeed in the long run. The smarter companies innovate continuously but also cut the dead wood regularly.